Since 2004, New York Painting Services has been completely licensed and insured to supply commercial businesses and residential homes throughout New York and New Jersey with a number of painting and contracting services. With applied friendly customer service, high moral standards, traditional values, exceptional work ethics to all the services we deliver with superior workmanship, New York Painting Services has successfully built a reputable company. New York Painting Services artisans are among the elite; with specialties, skills, experience, and training, they are more than qualified to perform any of the services we offer with attention to detail. 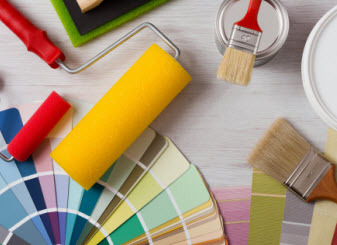 New York Painting Services ensures our customers receive nothing less than premium quality results, in so doing; we exclusively utilize high-end products, materials, and equipment. New York Painting Services assists customers with the interior designing and correlating painting or wall coverings to achieve the look and style you desire, including popular Contemporary Design. Modern style and Contemporary are often believed to be one in the same, but even with the similarities, there are differences that separate them. Avoiding dark and clutter, contemporary emphasizes comfort and welcoming feelings. Offices, stores, lofts, and homes all look amazing with the Contemporary design. With contemporary design, it’s important to stick the basics; fundamental, simplistic, subtle sophistication, texture and clean lines define contemporary design when it comes to decorating with the focus being spacious living, minimal accessories, color and shapes that are sleek and fresh. 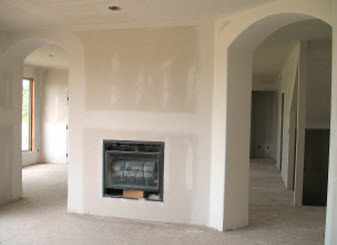 Paint Colors: Neutral are the choices; black and white being the primary contemporary style. 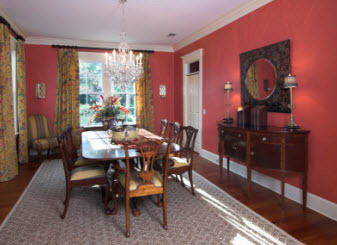 Bold and bright colors can accent the room when white or other neutrals are used. For example, painting the walls a neutral color can give you an excellent backdrop for a few bold accessories. If you opt for pastel walls, than be sure trim and décor are neutral in color. Design Lines: With contemporary style, less is more; the bare space on the walls and in between furnishings is just as important as the pieces themselves. Each piece should be unique and standout, but serve a practical function. High ceilings, bare windows and floors, as well as geometric shapes for structure and art are components of contemporary design lines. Broken bricks provide texture and stability; exposed air ducts hanging from the ceiling as well as other utility pipes are structure elements you can take advantage of to impose the Contemporary style. Blending them with existing walls can make them a subtle additive, or even painting them a bold contrasting color can exploit the practical accessory to the building. Furniture: Upholstery should be natural fabrics; wool, cotton, linen, silk, jute, coupled with texture and neutral colors get you started; and the basic engineering should be smooth, clean, geometric shapes. Just like the walls, furniture needs to be simple, uncluttered, and void of accessories and curves. Don’t embellish with bed skirts, trim, fringes or tassels. However, you can use sparingly a pillow to add a shot of color to the neutral base. Flooring: Floor is bare and smooth; hardwood floors, tile, or vinyl is typical. If rugs are needed, use sparingly with basic or geometric patterns. Carpets can be used but keep it in simple and neutral colors. For any assistance, call New York Painting Services and let our specialists get your New York/ New Jersey home or business in that contemporary style! Contact us today!